The sqlcmd utility in SQL Server is a command-line tool that lets you submit T-SQL statements or batches to local and remote instances of SQL Server. The utility is extremely useful for repetitive database tasks such as batch processing or unit testing. It also provides an easy way of simulating load to a database under development. To help you develop and test sqlcmd scripts, the query window in SQL Server Management Studio (SSMS) supports SQLCMD Mode, which lets you run most sqlcmd ‘colon’ directives as well as T-SQL statements. You can submit commands from within Windows script files (such as .bat), via sp_cmdshell, or through SQL Server Agent CmdExec jobs. You can also run sqlcmd within PowerShell. In addition, PowerShell includes, via SQLPS, a version of sqlcmd called invoke-sqlcmd that runs many, but not all, of the directives. This has the advantage of returning results as PowerShell objects. In this article, I introduce you to the basics of the sqlcmd utility and discuss how to create scripts from within SSMS and at a Windows command prompt and how to run or schedule these scripts. Once you know how to use the utility within these environments, you’ll be able to create commands that you can add to your Windows script files, SQL Server Agent jobs, and PowerShell SQLPS applications. The article includes a number of examples that demonstrate how to use sqlcmd. 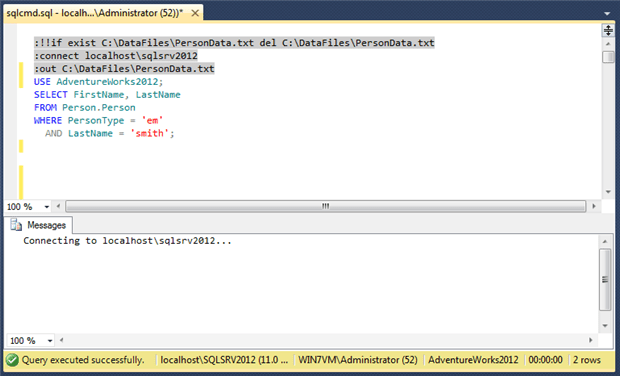 I developed these examples against a local instance of SQL Server 2012, with the AdventureWorks2012 database installed. However, you can use sqlcmd with any accessible SQL Server instance, from version 2005 on, and against any accessible database. Simply substitute the connection and database information in the examples, as appropriate, and you should have no problem following along. NOTE: The sqlcmd utility replaces the osql utility in earlier versions of SQL Server. Although the utility is still supported in SQL Server 2012, Microsoft plans to remove osql in a future version of SQL Server and recommends that you avoid using it for current development. If you’re already using SSMS regularly, as are most SQL Server developers and DBAs, you’ll find the SSMS query window a good place to start learning about sqlcmd. To run sqlcmd statements, you must change the query window to SQLCMD Mode by clicking the SQLCMD Mode option on the Query menu. NOTE: You can also click the SQLCMD Mode button on the toolbar if the button is there. If it’s not, you’ll have to manually add it by customizing your toolbar. The exact method for doing so varies from one SQL Server version to the next, so refer to SQL Server Books Online for details specific to your version. SSMS in SQLCMD Mode provides a handy environment for creating and testing your sqlcmd statements. Editing commands, for example, is much easier in SSMS than at a Windows command prompt. To get started in SSMS, connect to a SQL Server instance, open a query window, and switch to SQLCMD Mode. Then start typing. We’ll go through this code line-by-line shortly, but first take a look at Figure 1. Notice that the sqlcmd directives are automatically highlighted in gray when you work in SQLCMD Mode. The T-SQL statements appear as they would in regular query mode. Although this example is specific to a local SQL Server instance, you can connect to any available instance for which you’ve been granted access. If that instance is the default one, you need only provide the server name. In addition, when you specify the server and, optionally, the instance name, sqlcmd uses Windows authentication to connect to SQL Server with your current account. However, you can also specify a username and password when connecting to an instance. To specify a username, add the -U switch followed by the username. To include a password, add the -P switch followed by the password. If you enter the username option without the password option, you’ll be prompted for a password. The command specifies that all query results should be redirected to an output file, in this case, the PersonData.txt file. If the file already exists when you run this commend, the file will be truncated. For this reason, you might not need to run a Windows command to first delete the file, as we do in the first line. It all depends on your specific needs. Of course, you don’t have to redirect your output to a file, but if you don’t, the results will appear in the output pane of the query window. As mentioned earlier, using SQLCMD Mode in SSMS can be useful for developing and testing your sqlcmd code. However, you can then run your commands at a Windows command prompt by using sqlcmd in interactive mode. To work in interactive mode, open a command prompt window and enter sqlcmd at the command prompt. The prompt’s drive letter will be replaced by a 1, which represents the first line where you start entering your commands. The lines are numbered sequentially until all the commands are submitted, and then the numbering starts again. In this case, I’ve used a period to represent the local computer, and I’m connecting to an instance named SqlSrv2012. But you can connect to any accessible instance. The USE statement will change the database context to the AdventureWorks2012 database, and the SELECT statement will retrieve data from the database. However, these statements are not submitted to SQL Server until you type GO and then press Enter. The utility then submits the statements and returns the results to the command prompt window. NOTE: The GO command is a client-side ‘batch delimiter’ directive that is common to sqlcmd and SSMS. It is not a Transact SQL statement. it can be followed on the same line by the number of times you wish to run the preceding batch. Unless you specify this, it is just run once. Figure 2 shows what the command prompt window looked like on my system after I switched to interactive mode and submitted the statements. Notice that with each line of code, the line numbers are incremented, but after the GO command runs, the command prompt returns to 1. Once again, you enter each line and then submit the statements by using GO. Figure 3 shows what the command prompt window looked like on my system after adding the next set of commands. In this case, I typed nothing at the first line and simply pressed Enter to add space to my commands. Then I typed the T-SQL statements and entered GO. The results show that I changed the database context and that 273 rows were affected. If I had wanted, I could have then run a query against the new table to verify that it had been created correctly. The connect command establishes a connection to a SQL Server instance, and the out command specifies that any query results should be outputted to the PersonData.txt file. Next come the T-SQL statements, followed by the GO command. After all this, we issue an exit command, which tells sqlcmd to quit interactive mode and return the command prompt window to its normal state. Interactive mode is useful when you want to run ad hoc queries at a command prompt. However, where you’re likely to gain the most benefit from the sqlcmd utility is by creating complete commands that you can run at a command prompt (in what I refer to as command mode), add to your Windows script files, run as part of SQL Server Agent jobs, or use in other ways. sqlcmd -S localhost\sqlsrv2012 -d AdventureWorks2012 -Q "SELECT FirstName, LastName FROM Person.Person WHERE BusinessEntityID = 240"
The first issue worth pointing out is that the command, as shown here, might appear on multiple lines when you view it. In reality, this is a single-line command that is wrapping across multiple lines here because of margin limitations. However, you do not press Enter until you’ve entered the entire command. The command itself starts with sqlcmd to launch the utility and then uses the -S switch to specify the SQL Server instance, as we sometimes do when entering interactive mode. Next, we use the -d switch to specify the database. (Note that switch names are case-sensitive.) Finally, we use the -Q switch to define our T-SQL statement, enclosed in double quotes. In this case, we use an uppercase Q to run the statement and immediately exit the sqlcmd environment. If we use a lowercase q, we’d end up in interactive mode. Figure 4 shows what the command prompt window looks like after I ran the command. This time, we’re returning a list of employees from the Person table and ordering the data by name. When we run the command, the sqlcmd utility adds the employee names to the file, without returning results to the command prompt. Once again, the results are outputted to the Employees.txt file. At times, you might want to create a script file that you can use in multiple situations, in which case you might want to be able to pass in variable values when calling the file. To do so, you add placeholders to your script file that let you pass in the values. Notice that, to specify the PersonType value in the WHERE clause, I use $(type). The type value serves as the variable name, which can be referenced when calling the file. To use it as a variable, I’ve enclosed it in parentheses, preceded those with a dollar sign, and enclosed the entire thing in single quotes. I then follow the same convention for the name variable. Notice that I use a single -v argument and specify a value enclosed in double quotes for each variable. Once again, the command returns data about two employees whose last name is Smith. The query results are outputted to the Employees2.txt file. Not surprisingly, the sqlcmd utility can do a lot more than what I’ve demonstrated here. As mentioned earlier, the utility supports a number of sqlcmd directives in addition to those we’ve covered. The utility also supports many more switches than what we’ve used in the examples. Again, refer to the topic “sqlcmd Utility” in SQL Server Books Online for more details about commands and switches. You’ll also find plenty of useful information in the Simple-Talk workbench “The SQLCMD workbench,” written by Robyn Page and Phil Factor. What you’re likely to find is that the more you dig into the sqlcmd utility, the better you’ll appreciate what a valuable tool it can be, especially if you want to automate and schedule tasks related to local and remote instances of SQL Server. sqlcmd -S Server -d Database -i C:TempQuery.sql -o C:TempResults.txt -s"	"
Unfortunately, the extra spaces are still present in the output file. I tried BCP with -c, but it doesn’t include the column headers. Stackoverflow had some options, but they’re a bit ugly (http://stackoverflow.com/questions/1355876/). The only other option I could think of was to use sqlcmd and then use some sed commands to cleanup the text (using sed from GnuWin32). Is there an easier method to export the results of any query (not just a table) to a tab-delimited text file using the command line? I don’t know of any way that SQLCMD can be persuaded to output a proper tab-delimited file, which is an odd omission for a utility that has been updated over the years, but the article that Robert mentions that Robyn and I wrote a while back shows a work-around which is, I’ll admit, ugly. I use a simple script file to query backup age for my databases, then I put the sqlcmd on a for loop and run it agaisnt 100 servers, saving the output to a CSV file. The out out is saved, and the emailed, and I can open using ms excell. Is there a way to append data to an existing file with sqlcmd? I know you said the file is truncated by default, but I was wondering if there was a work around. I write data to a huge file daily and most of the records do not change. Thank you. i noticed that in your article was this statement "your commands and T-SQL statements are executed in the specified order." however, i’ve had problems where the sqlcmd commands are executed first and then the TSql commands are executed. the 2 ‘dir’ commands are executed first, and then the 2 ‘print’ lines. i discovered this in a script we had that deleted an SSIS pkg, then ran a sql query that checked that it was deleted, then re-added a new SSIS pkg, then ran a sql query that checked that it was added. the 2 sqlcmd commands that deleted then added the SSIS pkg executed first, then the sql query that was supposed to check that the first sqlcmd deleted the SSIS pkg executed and reported the pkg wasn’t deleted, because it had already been re-added. is there an explanation for this out-of-sequence execution? I use a tab.bat file to set the following as environment variables, subsquently using %tab% or %qtab%. (%qtab% is the same as "%tab%"). Note that TAB stands for the tab character. You can easily create the bat file with notepad. * See above post for %qtab%; if inside a cmd /F:off window you could instead type -s"TAB"
Great article. One question, does the SQL login you use as part of the sqlcmd need to have specific permission to the database for example bulkadmin. I’d assumed that would only be the case if your command included bulk insert and any alter table or inserts would just need the relevant access on the table. As far as I’m aware, the requirements for SQLCMD are no different to the same batches in an SSMS query window, so you’d be right in your assumption. What makes you suspect that this isn’t so? Thanks for the very quick reply. That’s good to know that my assumption is correct. My suspicions came after recently picking up a process that uses SQLCMD to deploy huge amounts of data and database structure changes. The sql login it uses has a number of special roles including BulkAdmin, so was concerned if that got taken away (due to new policies) it would break the process. Thanks for this article. Had a question on this though. I have script for replication that connects to distributor, publisher, and subscriber, and executes appropriate scripts at the appropriate instances. Everything used to work fine if the instances are configured at their default ports, and SQL browser service is on. But now, to harden our SQL environment, we had reconfigured SQL ports to non-default ports, and have turned off the SQL browser discovery service. Also, went ahead and created an alias on the server/client/wherever this connection is cosumed to redirect to that non-default port – but the :CONNECT no longer works with non-default ports. Please advise. Any pointers would be greatly appreciated! @DBArgenis responded with a pointer to the working non-default port, and when parameterized, it needs to be quoted. How can I change this to use a text file that is a list of server names to execute the sql command against. Is there anyway to get SQLCMD mode to run in a sql job step?